At The Maker's Space we love to see people of all skill levels learn something new. Because of this we provide courses on a regular basis with a wide variety of skill level and topic. In time we hope to offer courses in maker crafts outside of woodwork. All courses are led by master craftsmen at The Maker's Space where you will be instructed through every stage of the project. The courses include all materials so just bring yourself and some closed toe shoes. Check out current courses and contact us if you have any questions. Courses are limited to 6 people per date. New to woodworking or looking to get started? 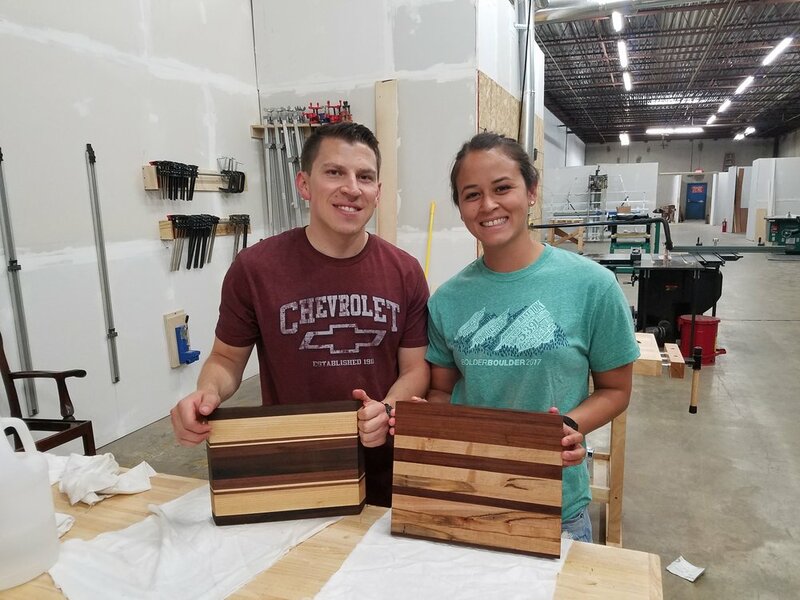 This beginner level woodworking course teaches you how to safely and effectively use a miter saw, jointer, planer, table saw, and sander while creating a one of a kind solid wood cutting board for your kitchen. This is a four hour course We will take a lunch break for 1 hour while the boards are glued up. Courses are limited to 8 people per date. Have you had some experience in the shop and are now looking for a project to test your skills? This intermediate level woodworking course teaches you how to safely and effectively use a large wood shop and its tools to produce a beautiful, functional piece of furniture for your home. This is a six hour course. There will be a 1 hour lunch break while the glue up drys. This CNC course is a prequalification for use on the X-carve CNC at The Maker's Space. A qualified teacher instructs you in the safe and efficient use of the Inventables X-Carve. This four hour course covers both the software and hardware use of the machine. This course includes all materials and tools so you just need to bring yourself and a pair of closed toed shoes. Courses are limited to 4 people per date.